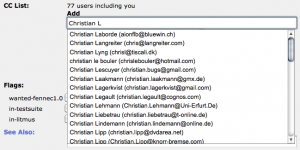 A small Bugzilla improvement | LegNeato! 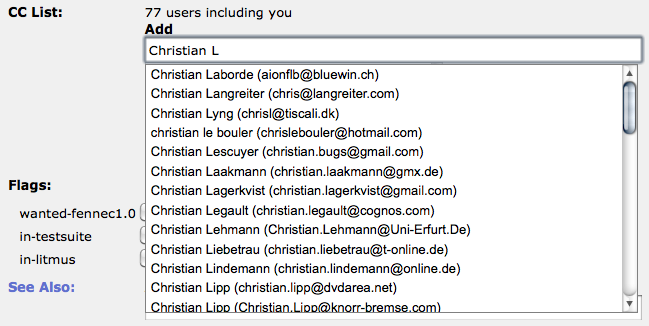 Previously, searching for “Christian L” returned all users with “Christian” in the first or last name as well as all users with “L” in the first or last name. As you can imagine, this was a long list to search through (lots of names have an “L” somewhere) and made searching by name useless–especially when you didn’t know how to spell someone’s name. Most people work around this bug by searching just for a IRC nick using “:[ircnick]“. IRC nicks are generally unique which produces a smaller list, and inserting the colon assures that there are little to no substring matches. I now find myself searching for irc nicks less and less and just using a person’s name. This is one less mental step for me as I no longer have to map from a person to an irc nick in my head. This was my first Bugzilla patch and the first improvement I wrote that got rolled out on bugzilla.mozilla.org. Special thanks to Max for guiding me through the patch / Bugzilla codebase. I hope that this small change made Bugzilla a little more usable for everyone.